Peace, stability and progress of the State are important as the country is marching on the multi-party democracy path chosen by the people. In this regard, the Tatmadaw has been endeavouring for ensuring eternal peace. The decision of the New Mon State Party-NMSP (Mon) to sign the Nationwide Ceasefire Agreement-NCA at this time is welcomed with pleasure, said Commander-in-Chief of Defence Services Senior General Min Aung Hlaing at his meeting with Chairman of NMSP (Mon) Nai Htaw Mon and party at the Bayintnaung Parlour here this morning. 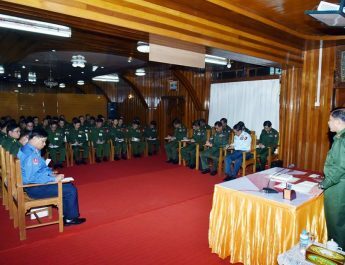 Also present at the meeting together with the Senior General were Lt-Gen Min Naung, Lt-Gen Aung Kyaw Zaw, Lt-Gen Soe Htut and senior military officers of the Office of the Commander-in-Chief (Army). 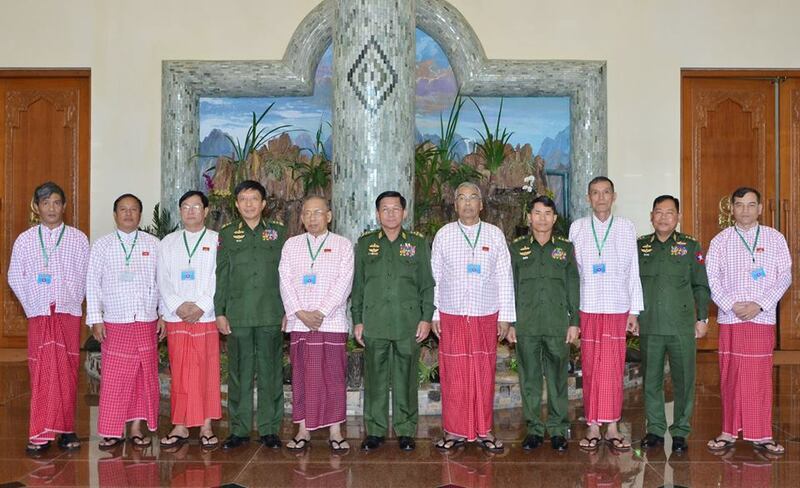 The NMSP chairman was accompanied by General Secretary Nai Aung Min and members. 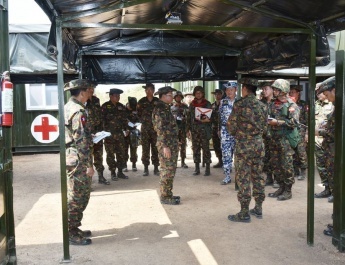 At the meeting, the Senior General said the successive governments tried to restore peace and end the ethnic armed conflicts that broke out together with independence. 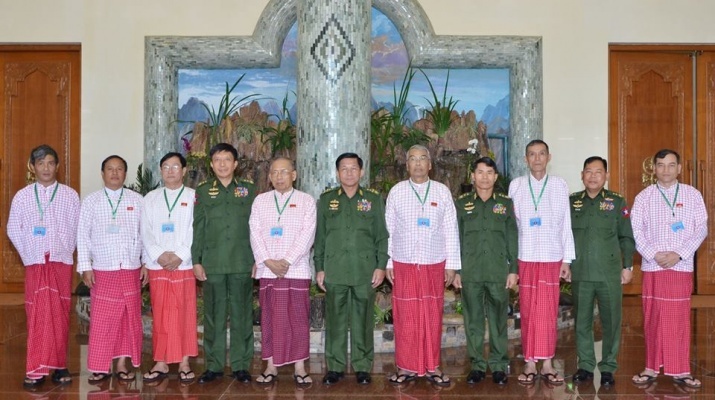 The Tatmadaw is always ready to join hands with the armed ethnic groups on the road towards peace. Armed ethnic groups should be free from any doubt and have full trust in joining the peace process. Not only the leaders but also the rank and file should understand the peace process. It is an important time for all to march harmoniously on the road to multiparty democracy. The NMSP (Mon) chairman expressed pleasure for the Senior General’s warm welcome for NMSPs’ participation in the NCA. We decided to sign the NCA assuming that the points agreed on at the eighth meeting held between DPN of UNFC and PC of the Union Peace Commission should be accepted. The government and the Tatmadaw for their part are urged to render help in facilitating the NCA signing. We will work for the peace of the country, for the protection of people’s lives and property and in the public interest.The Senior General said Mon State already has good prospects for regional development. By cooperating with the government and the Tatmadaw and walking along the peace road, NMSP (Mon) will have more opportunities for regional development. Its pursuance of the peace path and freedom from doubts will contribute to further national development, and the people will welcome this. The burning desire of the Tatmadaw is state peace, stability and prosperity. The Tatmadaw is ready to cooperate. Next, both sides discussed matters related to the NCA signing and the Tatmadaw’s assistance to facilitate future tasks. After the meeting, the Senior General presented food gifts to the NMSP (Mon) chairman and party and posed for a documentary photo.